Gabriel Landeskog, Matt Duchene, Nathan MacKinnon, Erik Johnson, Tyson Barrie and Semyon Varlamov still are the Avalanche’s six-man “core,” all at various points in recent years signed to long-term extensions. They’ll remain that core unless, or perhaps until, Duchene answers his cell phone and gets the news that he’s headed for … the airport and beyond. Or perhaps until the core, however it is defined, grows. Combined, the six salary cap hits for 2017-18 are $35.27 million, or nearly half of the NHL’s $75-million per-team maximum. That’s commitment, faith, and on the part of general manager Joe Sakic and management, considerable risk. Now, in the wake of a horrific 2016-17 season — when the six massively underachieved, even taking into account injuries to Johnson (broken leg) and Varlamov (groin muscle issues) — the challenge isn’t simply to nudge their games up to elite levels. Given the makeover that began down the stretch last season and continued through the off-season, and left the Avalanche both younger and faster, the additional obligation is to lead. And lead in ways that go beyond numbers and letters — a “C” or an “A” — on jerseys. They need to do it on the ice, in the dressing room, on the bus and plane … you name where, they need to do it. In Varlamov’s case, of course, given his position, that leadership is more about performance than it is for the skaters. Yet there can be a contagious attitude there, too, as evidenced in the days when a swaggering, prideful, often angry No. 33 manned the Colorado crease. And, yes, that leadership obligation includes Duchene, now skating on a line with Avalanche newcomers Nail Yakupov and Alexander Kerfoot. The line has been electric so far. 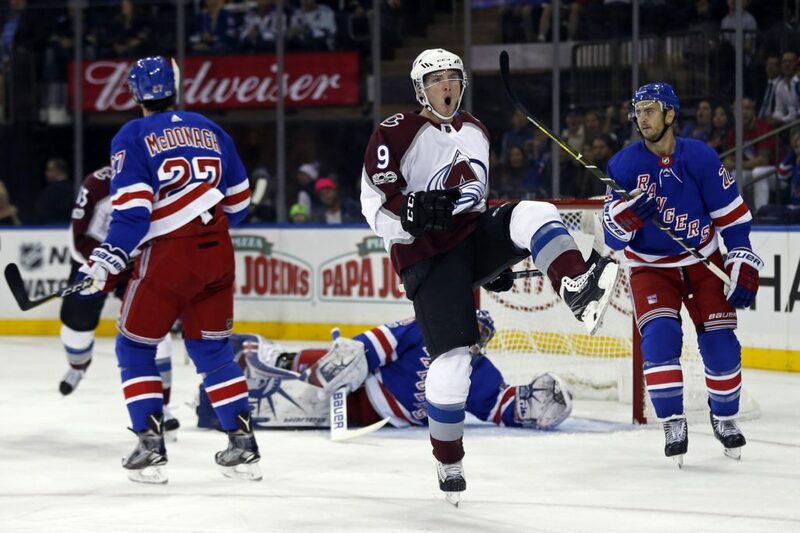 As the Avalanche beat the Boston Bruins 6-3 Wednesday at the Pepsi Center, Yakupov — seeking to change his image as a washout NHL No. 1 overall pick — had his third goal of the young season. Duchene scored his second goal, and Kerfoot, the rookie from Harvard, got his career first. So despite the perception that he came to training camp an unhappy man, especially given his bizarre 14-second statement on reporting day, and his reluctance since to discuss his situation, Duchene has two goals and three assists through four games for a team that for the second straight season is off to a 3-1 start. Earlier Wednesday, after the morning skate, I had asked Duchene if he still could be one of the Avalanche’s leaders under the strange circumstances. “I’m not going to change who I am or what I am in my approach,” he said. “I’m playing with two young players on my line and I’m talking to them a lot, and we’re working together on the bench, in the intermission . . . The problem with that, of course, is that citing last season as setting a bar, or as anything to emulate, is shaky. Duchene is a highly paid pro in the early stages of his ninth season, one who hit the 30-goal benchmark two seasons ago, but has regressed since. This has always been true, but it was apparent than ever last season: His game can be contaminated by a strange combination of: a) getting down on himself, and b) it’s-just-bad-luck denial. Then there is the apparent refusal to accept what all highly paid pros should know, that every general manager in the game has an obligation to make his team better. A GM exploring or listening, or both, should be an accepted given. In all sports. In every dressing room. I’m convinced that at this point, given the drop in his value in the past year, the only way he will be traded in the near future is if the Avalanche — just as if former teammates Joe Sakic and Peter Forsberg had discussed it — wants to remove him as a possible distraction and takes the best deal offered. A month after training camp opened, though, the chances of that happening seem to be lessening. They all might make it through this. If he stays, to completely redeem his image, he must not simply continue to play well, he must accept the mantle of heightened leadership. Johnson, 29, missed nearly 12 weeks of last season after suffering a broken leg in early December. “There were guys in our locker room before like Iggy (Jarome Iginla) and ‘Beauch’ (Francois Beauchemin) who we had so much respect for,” he said. “I think sometimes as players, you get a little uncertain talking in front of guys like that because they held so much respect. Sometimes you might worry about what you say, you don’t want to disagree with them. We learned a lot from those guys in their time here, and they helped us a lot. But now it’s an infusion of talent and youth, and it’s truly our team from the standpoint we feel comfortable saying whatever we need to say in the locker room and making the decisions on what needs to be done on a daily basis. MacKinnon hasn’t yet scored a goal, but he has four assists through four games. Landeskog still is only 24, but this is his sixth season as captain.